Istanbul is working towards an integrated transport network to turn the tide against motor vehicle and make mass transport the dominant form of mobility once more. Photo by Andreaffm/Flickr. Turkey has had good fortune in seeing the personal incomes of its citizens rise from US$ 6,800 in 2000 to US$ 14,700 in 2011. Yet with increasing incomes has come a trend towards personal motorization, with private vehicle ownership jumping from 889,000 to 1.7 million between 1997 and 2007. Congestion has escalated in the city of Istanbul, with ensuing economic losses estimated at US$ 7.2 billion per year. However, according to an origin-destination survey, 49% of trips are still on foot. Out of the approximately 10 million motorized trips in a day, 71% were in public transport and 29% in private vehicles. The emerging trend towards motorization combined with still-high levels of mass transport shows that the populace has not yet shifted towards motor vehicles as their dominant form of mobility. Now is the time to develop even more forms of mass transport to enable Istanbul to turn back the tide on the motor vehicle and create options that promote cleaner air and healthier citizens while avoiding lock-in and auto-dependency. The natural typography and a wide range of existing mass transport modes give Istanbul an edge in stemming personal motor vehicle usage. Situated between the Bosporus Strait, the Marmara Sea, the Golden Horn, and the Historic Peninsula, the terrain is incredibly hilly. This topography makes six lane highways difficult and expensive to build. Furthermore, Istanbul’s long history of mass transport makes it so the city’s residents are acclimated to it, and might more easily return in the face of rising congestion. Istanbul’s numerous existing transport options are also a key asset. Istanbul already has a bus rapid transit (BRT) system, historic trams, funiculars, cable cars, boats and an expanding metro and regional rail, complemented by shared taxis (dolmus) and a large fleet of company buses (servis). This existing infrastructure, if expanded and coupled with effective land-use policies will likely also play a factor in bringing back current car owners. Istanbul’s Transit Map shows a city with a complex integrated transport network that is working to create more connections and increase ease-of-use between different modes. Photo by Wikimedia. Istanbul’s transport system also offers a high degree of connectedness, making moving around the city using mass transport far easier than in many cities. Journeying from Taksim Square, to Söğütlüçeşme and back to the Historic Peninsula is convenient through a combination of metro, tramway, and funicular. Part of this convenience came from clear signage and automatic fare card machines. Ease-of-use is an often forgotten component of why people use mass transport, but it is nevertheless an important one. Istnabul’s leaders are well aware that congestion has become horrendous in the city, and they are using citizens’ frustration as a mandate to make important infrastructure investments for Istanbul’s future. The metro rail network will be expanded, with the Mecidiyeköy-Mahmutbey metro line set to be expanded 18 km (11 miles) and is set to go into service in 2017. However, to stem the tide of motor vehicle usage, Istanbul will likely need to go even farther, enhancing access to transport facilities for people with disabilities, as well as creating safe spaces for people to walk to and wait for transport. Creating a biking culture in Istanbul, if possible given the city’s hilly terrain, might also provide the city’s citizens with more impetus to reverse the motorization trend and reassert their commitment to sustainable mass transport. 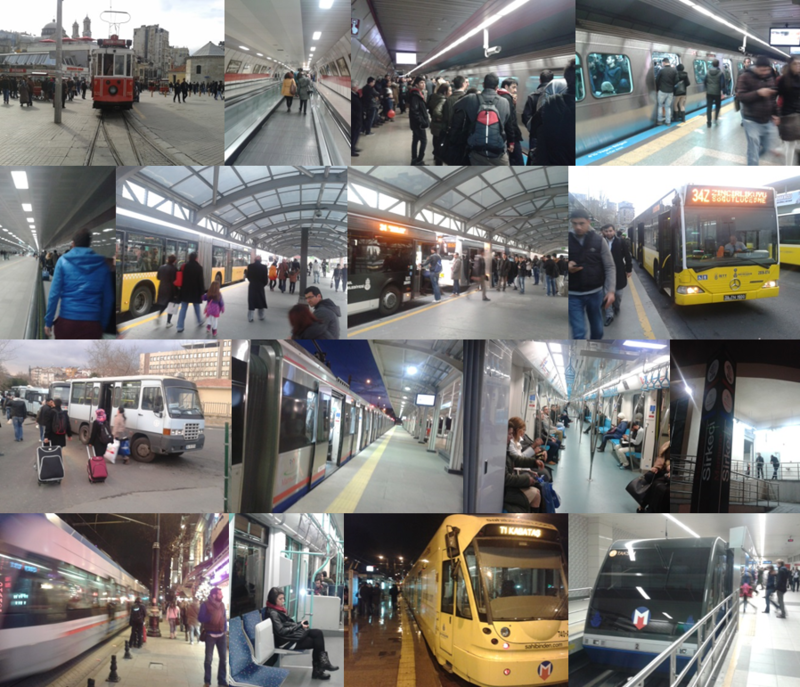 From top to bottom clockwise: Taksim Square Historic Tram to Tünel; Connection to Platform at Taksim Station; Metro Platform Taksim Station; Metro Platform Sisli Station; Connection to Metroüs; Metrobüs Mercedekoy Station (two photos; European Side); Metrobüs Söğütlüçeşme Station (Asian Side); Microbuses in Kadiköy; Mamaray Ayrilikcesme Station (Asian Side); Interior of Marmaray train traveling below the Bosphorus Strait (world deepest immersed tunnel); Marmaray Sirkeci Station Entrance (for elevator shafts); Modern Tramway in Sultanahmet; Interior of Modern Tramway; Modern Tramway Kabatas Station; Funicular Kabatas-Taksim (594m). D. Hidalgo/EMBARQ.